Heat oven to 375°F. Grease large cookie sheet. Cook beef in 10-inch skillet over medium heat, stirring occasionally, until brown; drain. Stir in salsa; remove from heat. Stir Bisquick, cheese spread and hot water until soft dough forms. Turn dough onto surface dusted with Bisquick; roll in Bisquick to coat. Shape into ball; knead 5 times. Roll into 14-inch circle; place on cookie sheet. 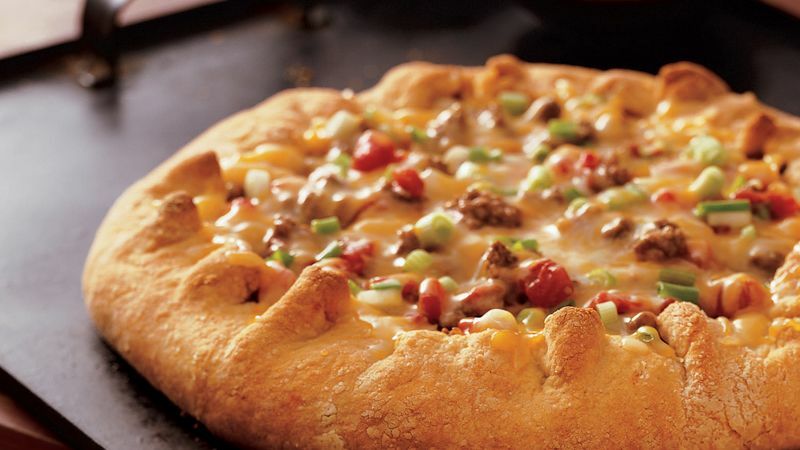 Spread beef mixture over crust to within 2 inches of edge. Sprinkle with onions. Fold edge over beef mixture. Sprinkle with cheese. Bake 25 to 28 minutes or until crust is golden brown and cheese is melted. Garnish the pizza with chopped tomato and shredded lettuce. Use the jalapeño-flavor process cheese spread if you prefer a spicier crust.